LAHORE, Pakistan (Morning Star News) – Police in Pakistan say a Christian couple tortured and slain this month over accusations that the wife desecrated the Koran were innocent, while relatives said politicians are trying to shield the killers from justice. Urged to act from mosque loudspeakers, a frenzied mob on Nov. 4 tore the clothes off Shama and Shahzad Masih, struck them, broke their legs, dragged them behind a tractor and threw them into the burning furnace of a brick kiln – even though Shama was illiterate and could not have known even if koranic verses were among debris that she had burned. Kasur District Police Capt. Jawad Qamar told Morning Star News that police had confirmed that Shama Masih was illiterate and had no idea of the contents of pages that she had burned. “She was not guilty of blasphemy,” he said. On Nov. 2 Shama Masih was cleaning her quarters in Chak 59 village near Kot Radha Kishan, Karur District, about 60 kilometers (37 miles) southwest of Lahore, when she found amulets of her late father-in-law, who had used them in the practice of black magic. The amulets may have contained koranic verses, and a Muslim co-worker, Muhammad Irfan, noticed the half-burnt papers and accused the family of desecrating the Koran, relatives said. 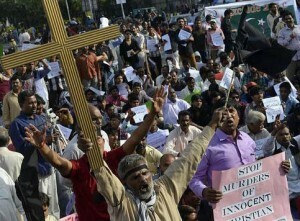 Under Pakistan’s widely condemned blasphemy statutes, intent must be shown for a conviction of desecrating the Koran. At a press conference in Islamabad on Monday (Nov. 16), family members said Islamists have offered them land and money as compensation for the murders in an attempt to stop them from prosecuting. While police have reportedly arrested at least 50 of those named in a First Information Report (FIR), relatives of the couple said that influential Muslims of the area, including a Punjab Province lawmaker, were issuing threats in an attempt to force them to reach an agreement with the killers. Shahzad Masih’s brother, Shahbaz Masih, and his wife Parveen Masih demanded that the government provide them with protection, saying they had already informed the Kasur District police officer of the threats. They also demanded the formation of a judicial commission to investigate the mob violence, adding that non-Muslim representatives should be included in the team. “All we want is a fair investigation of the case,” said Shahbaz Masih, demanding that Justice Waheed Siddiqui, a retired Federal Shariat Court judge, be included in the judicial commission. Among other demands, the deceased man’s family called for the commission and a Joint Investigation Team to make their reports publicly available immediately after completion. Masih also urged the Supreme Court to take suo moto notice and order an independent inquiry into the attack. The family’s concerns come amid reports that the provincial lawmaker of the area, Muhammad Anees Qureshi, was present at the crime scene when the throng of hundreds tortured and killed Shama Masih, 28 years old and five months pregnant, and 32-year-old Shahzad Masih. They are survived by four children, the oldest 7 years old. Family sources said that Qureshi, a member of the ruling Pakistan Muslim League-Nawaz (PML-N) government, was also making efforts to shield the primary suspect, Riaz Kamboh, from justice. Kamboh, a former municipal councillor, is also affiliated with the PML-N and holds considerable influence in the villages surrounding Chak 59 village. He is accused of throwing the couple into the furnace after pouring tractor diesel on their bodies. The relative said Qureshi, a member of the Punjab Parliamentary Assembly, was trying to force the impoverished Christians into reaching an agreement in return for a large amount of money. Shahzad Masih was a bonded laborer who was working to repay a sum of money he had received, one of the reasons sources have said his employer locked him in an office at the kiln after a mob formed. “Hordes and hordes of Muslims loaded on tractor trolleys arrived on the scene during his [Qureshi’s] presence, yet the lawmaker made no effort to rescue them,” the relative said. Qureshi has requested the family not register a separate case against Kamboh, brick kiln owner Yousaf Gujjar and Imam Ghulam Hussain, among others, he said, adding that the demands were made through local administration and land revenue officials. Qureshi denied that the couple was thrown into the furnace in his presence. Morning Star News made repeated efforts to get Qureshi’s comment on accusations that he was influencing the relatives of Shahzad and Shama to reach an agreement with any of the murder suspects, but the lawmaker declined. Punjab spokesman Zaeem Qadri told Morning Star News that the suspects would not be able to escape prosecution, because the state was the complainant in the case. Qamar told Morning Star News that the area’s local police in-charge had sent a team to the site when he was informed of tensions, but that mobs were too large to be contained by just five men. “It was Ashura [a Shia Muslim commemoration] day, and all district police was deployed on Shia procession routes and Shia places of worship for security, which is why it took time to gather a bigger contingent,” he said, adding that police were now trying their best to arrest all the remaining accused in the case. Contrary to published reports, Qamar said police have arrested 43 of some 60 named suspects, of whom 39 were in jail, while four were to be produced in an anti-terrorism court today on completion of their police remand. Tahir Ashrafi, a member of the Council of Islamic Ideology (CII), Pakistan’s top religious body, held police responsible for failing to act to protect the couple before the mob violence occurred. “All culprits must be arrested and punished, including the cleric [who made the blasphemy accusation in a mosque] if he’s involved,” he said. 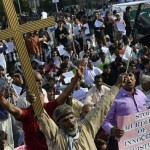 “If the perpetrators of Gojra, Joseph Colony and the Rimsha Masih case had been punished, no one would have dared to mete out such barbarity on the poor Christian couple,” Solomon said.